Birmingham earned their first league win of the season as they edged past struggling Peterborough at St Andrews. Michael Bostwick's long-range effort for the visitors came back off the crossbar before they fell behind. Peterborough keeper Robert Olejnik attempted to get to a Wade Elliott free-kick before Peter Lovenkrands but punched the ball into his own net. 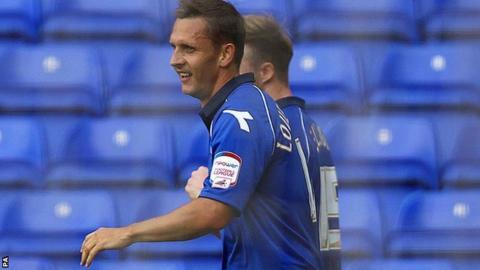 Lovenkrands was denied a penalty for the Blues but they held on as Posh lost a fourth league game on the trot. Peterborough have only been beaten in the opening four games of a season once before and that came in 1972. They are the only Championship side without a point as they prop up the division, while Birmingham will be relieved after securing victory. It was more about the points than the performance for Blues boss Lee Clark and his side had to survive some shaky moments. Peterborough went close when Lee Frecklington had a shot deflected wide, Grant McCann fired over and Tyrone Barnett headed off target. Birmingham trio Marlon King, Nathan Redmond and Chris Burke each missed chances to seal their side's win late on but they were not punished.